I am from Korea and I used to be college basketball player but recently moved to U.S. I had superior athlete body shape before I injured my ankle last November. It was eversion sprain(deltoid ligament), I usually have multiple inversion sprain during practice or game but this one was pretty severe so I decided to use crutches. I lost noticible muscle on lower leg. After this incident I went to several different doctors but they all said it's just grade 3 sprain but they think it's fine. I had constant pain inside my ankle and my foot arch dropped dramatically. So I started not trusting doctors but when I did web research I thought mine was kind of posterior tibial tendon dysfunction but after I read your strengthining foot I thought that would be my case. I'm dying to get back to court but how much pain can I ignore and push? Because the ligaments have been repeatedly stretched, the ankle was able to invert more than it might have with earlier sprains. This inversion causes an excruciating scissors or pincer action crushing the tendons and soft tissues, including joint margins of the inside of the ankle. 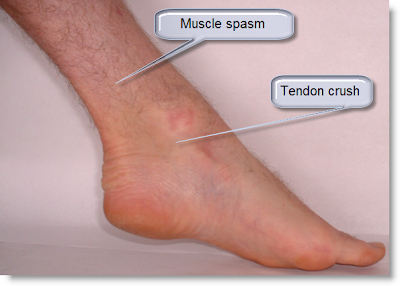 The main tendon to be crushed is the tibialis tendon which passes the inside of ankle. If this is damaged, the arch of the foot will be weak and may appear to drop. When the arch drops, there is excess torsion on the long bones of the leg. This may cause the knee to turn inwards (Patella Squint) and may result in pain under the kneecap and inside margins of the knee joint. There may also be hip pain. This ankle injury will throw strain on other muscle-tendon units that support the foot, including the muscles that activate the big toe (Flexor hallucis longus). This will be felt as tenderness and hardness of the tissues immediately to the side of the achilles tendon. This spasm is often mistaken as an achilles tendon injury and is one reason why achilles pain is so resistant to treatment (Because the wrong part is being treated!). Deep tissue massage of the affected areas. Have this done just once a week and continue for several weeks. The first 2-4 sessions may make the condition worse; but significant progress is usually made from about the 4th session. Continue weekly sessions until the ankle is pain free. Fit Formthotics Shock Stop and wear in all shoes, including sports. Do the ankle strengthening exercises in the video above every 3rd day. Do progressive agility exercises, consisting of balancing challenges on your toes (wobble board, balance beam, tightrope walking , etc), walking and then jogging on uneven ground, running barefoot on sand and grass and so on. When doing high risk sports, fit an ankle brace or strap the ankle until you are 100% recovered and back to full fitness. Start gradually with your resumption of activity, being careful to stay within tolerable pain at all times. Be patient, giving yourself several weeks of graduated recovery to full fitness. You may find taking a glucosamine supplement for three months may assist repair of any damage to the ankle joint margins. Please read this article about inflammation.